Our resident columnist Karl Alexander has been racing again, in what has been a busy and successful start to the 2015 season for him. 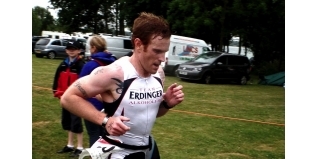 After winning the Outlaw Half, he went in to the Triathlon England National Championships at the Grafman Triathlon on Sunday with a fair bit of self imposed pressure to perform well once again. There would be no victory this time around, but it was another excellent race against some top opposition on a wet and windy day. 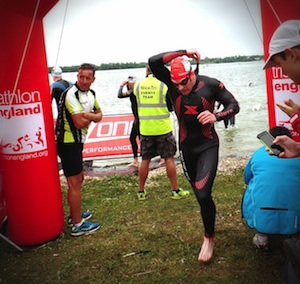 Having won the Outlaw Half a few weeks ago and had a solid performance at Windsor, I had put myself under a fair bit of pressure for a good performance, and on the drive to the event I was growing increasingly nervous. Arriving at 7am, I quickly registered and started to sort my kit out for the race. As I prepared, the first of the rain drops arrived and set the theme for the rest of the day. With the racking in transition all numbered and allocated, I was soon set-up and ready to race. All that was needed was a short run over the dam as a warm up and to get into my wetsuit. The race brief was short but very detailed, and before long wave one of the three waves were stood on the beach and ready to roll. At 8am the claxon sounded and we were off. Open water mass starts are frantic enough, but with a couple of hundred athletes all racing into the water there were arms and legs everywhere. I opted to start far over on the left hand side and after the initial maelstrom, found myself some clear water and got settled in. Sighting every 6-8 strokes I kept a good line and made the right turn at the first buoy. I was swimming well, having spent a fair number of hours in the pool the last few weeks. The training was paying off and coming through the Australian exit and out onto the second lap I was comfortably in the top 10. On the second lap I had a couple of other swimmers next to me and eased off, allowing them through and sat behind enjoying the tow. With the swim out of the way it was now time to tackle the 56 mile bike course. I was quickly through T1 and out on the road. The first couple of miles were out-and-back, something I like as it gives you the opportunity to gauge the distances to athletes ahead. I was about two minutes down on the lead and set about picking off those ahead. On a short but steep climb I managed to distance a few of the chasers and closed the gap down on those ahead. Little did I know that this was the only climb of any significance on the route. I ploughed on and at the second of the turn points I had reduced the gap to the leaders significantly - but so had a chasing group behind. Behind me a pace line had formed, and they were slowly but surely reeling me in. I upped my tempo but was delaying the inevitable; on the long straights I was a carrot dangling just ahead to lock on to. The first man to make the junction was Drag2Zero's Chris Goodfellow, and as he passed I looked back and slotted onto the back of the line. The group contained some excellent runners and I was determined to make the most of the bike course. Every time the road went even slightly uphill, I attacked hard, and every time opened a good gap which was closed down over the next few miles. I was becoming more and more frustrated and failed to notice when Kit Walker (Bustinskin) and Chris sneaked off the front. I worked hard to try and bring them back and they never got more than 40 seconds, but as we approached T2 I was in no man's land behind the two leaders and the chasing group. After quick dismount and short run into T2 I was out on the run and in third place. This was to be short-lived as the very fleet of foot Michael Birchmore and Andy Hamilton came past inside the first mile. I was gaining on both Chris and Kit Walker but losing ground to Oliver Milk (Redvenom). I was running reasonably well and before long had overtaken Kit and was closing in on Chris. On the out-and-back of the dam on the second lap, I was no more than five seconds behind Chris. I was still feeling strong and pushed on but just couldn't close him down. At the final turnaround with around 5km to go I was running on empty. My repeated attempts to get away on the bike were coming back to haunt me and I faded badly. With about 2km to go I was passed by Ian Turner (Greenlight PT) in a rematch of the Outlaw... he was taking his revenge! I attempted to lift my pace, but it wasn't to be. I crossed the line in 4:07:05, seventh overall and fourth in the 35-39 age-group. Of the top eight finishers, five were in the 35-39 category. All-in-all, despite not being the performance I wanted or am capable of, it was an excellent race. The bike course didn't suit me and the runners in the field nullified the strong bikers with a great tactical race. On yet another wet and windy day a huge thanks has to go out to the volunteers and spectators for their encouragement and support. Next for me is The Bastion which I know has hills, lots and lots of hills and I can't wait!